for the free world and for Israel. He said Israel and the U.S.
come out of such a conference." donors last year," Grass stated. the future. "Your coming here,"
yet adding to the strife.. .
the best we can afford. city in the Jewish State. Well, let me tell you, it is true. is about to happen to you. Poland and Israel Feb. 21-Mar. 5.
mittee, headed by Paul Frieser. must, to be able to volunteer. from 7 to 8:30 p.m.
sponsored by the World of! | Jews in the U.S. are the "new"
ptal care is less than minimal. children. They are our partners. mittee will be held at 10 a.m. Oct.
24 at Temple Beth Am, Margate. go to Israel this month.
! SoS ^to, 1? *" iantifkadvlaar. ^%UurentF*bius "i mm4ur ,mri"jr *"
" Francois Gros, *atra* in Israel. than they might have been. accordinfl to the high standards demanded by Jewish tradition. cast on Nov. 5 at 9 p.m.
Television Critics Association in Phoenix, Arix. Second Claaa Posteoe Paid at Haiiandaia. Fla USPS 86*470.
shall talk about it here. for thinking it would be fulfilled.
" I have good news and bad news. Empire, the story of Christianity. origin of the Sephardic Jews. did in Auschwitz and elsewhere. tory before the Jews . how did a small p .
filing was announced by Paul S.
more will in the near future." L*** of the Mitzvot ha. B'rith and B'nai B'rith Women. Bailey Hall, Dec. 4 at 8 pjn. out the region during the year. orchestras in the State of Florida. achievement of modem architecture, a short walk from ancient history. service, Kosher cuisine and more. Children sharingjparents' room stay free. Liberty Bell Perk. 3 Jabotmsky Street 92145 Jerusalem. Israel. Tel. 972 (02) 697777 Tetex: 26379. Samuel K. Miller and Al Young. Miriam Ring and Beatrice Sobo. elected a new president, Mr.
Oct. 21 at the Center, 6501 W.
required for the Oct. 29 meeting. under FREE In room with parents. EeU you, I was never shrewd. n't let me down completely. feeling is, I haven't done enough. or to be known in the world. bachelors who have many affairs. then there would be no story. say about marriage in general? was time for me to have a home. more than it will in the Diaspora? Israel, it will prosper nowhere. words, we are stepchidlren there. well as some of its liabilities. I keep on writing it. rain about 3500 years ago. Salt free. to leave a message for the world? IBS: I have no message at all. you were a young man? microbes and many other things. Torah Dance. Temple Social Hall. act show. Donation $4. 721-7660. Jazz. Tickets $6, $5. At Temple. Noon. Luncheon and card party. Beth Israel. 200 S. Century Blvd. tions from Miami to Palm Beach. 627-2277 in Palm Beach County. of affection of any kind. what way they could change. Mr.
Mrs. A. set new goals for herself. ter: 1 p.m. Meeting and film. "The Haj." Temple Beth Am. Gardens Phase 5 Recreation Hall. Chapter: 1 to 3 p.m. Meeting. Dr.
the human rights of the elderly. 2:30 p.m. At JCC. 6501 W.
Camins will discuss beauty tips. 8100 Sunrise Lakes Dr. No. tension at 7 p.m. Thursday Oct.
At Tamarac Branch, 8601 W.
understanding opera at 1 p.m.
2 p.m. Friday Oct. 26. 6601 Blvd. of Champions, N.
to noon Thursday Oct. 25.
at 2 p.m. Tuesday Oct. 23. V "" of the Senate"
moving the embassy at this time. his faith instructs him to do that. them are of Yemenite descent. I Jerusalem were closed Oct.
*i on the West Bank. are saddened by an empty chair. you hear "thanks" and "thanks"
after bathing in nearby pools. Publlx BskartM open at 800 A.M.
will be at 7:30 p.m. on Mondays. 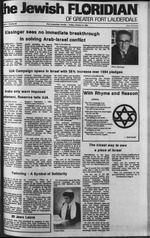 Nov. 19 Rabbi Kurt Stone. pose of Media Myths vs. Israel." Jan. 21 Dr. Joseph Silver. "Great Ideas from the Bible." Mar. 18 Rabbi Kurt Stone. will agree to "take assignment"
doctor to review your case. did not make a mistake. depends on a type of surgery. plexity of a given procedure. tW these two types of surgerv. will be celebrated at the! Rabbi Kmentus. Dr. Solomon Geld. Cantor Irving Groaaman. lighting time Rabbi Joseph Lanoner. Canter Shabtal Ackerman. 33080 Services: Friday 8 p.m Rabbi Morris A. Shop. 33321 Services: Sunday through Friday 8 a.m.. Sp.m ; Late Fridays"
27221 Services at Ban yon Lakes Condo Clubhouse. ra<. h ri.lay at A p m .Saturday 9 a m" Charles B.
r ndaySa m. Sp.m. Saturday 8:48am. Sp.m. ervices; Women. Tuesdays I p.m. Rabbi Aron Lieberman. YOUNG ISRAEL SYNAGOGUE OF HOLLYWOOD-FORT LAUD*"
through Friday 7 so am and sundown; Saturday. 6a.m ..sundown." m., sundown Rabbi Edward Davlt. Tamarac Service*: Dally 8 a.m.: mlncha 8 p.m. R*a* ct>,im "
S*rvk,v Friday S p.m ; Saturday 10 am Rabbi J*rr** *. ***"
RabM Nathan H. Fish. Canter Merrls Levkeeea. fr v Delya Biai. E.P. of blankets and sleeping bags. will be honored at a 10 a.m.
Bonds Tower of David Award,"
munity and to the Temple. You've worked hard, and you want your retirement years to be happy. in the rent.) ,. ,__ . Scheduled transportation and private limo service by appointment. Free cleaning arxl rwusekeefjir^. Ukefrwt rjakny views. Recreationa/and social programs. 24-hour medical security. Pool, sauna, fitness Spa. County. du\ 522-6*244. Other areas, call TOLL FREE WM0-343CLUB. Third Avenue to The Florida Club at NE Third Ave. and Sierra Drive. Decorator models open 9-5 every day. living at The Florida Club.